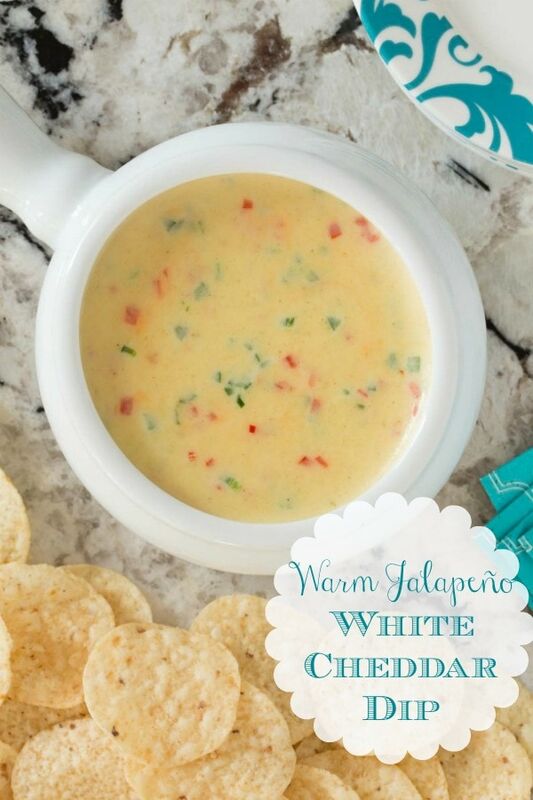 This Warm Jalapeño White Cheddar Dip is addictively delicious, so be sure to make plenty! It will disappear in the blink of an eye! If you’re looking for an appetizer or game day snack that everyone will love, look no further! 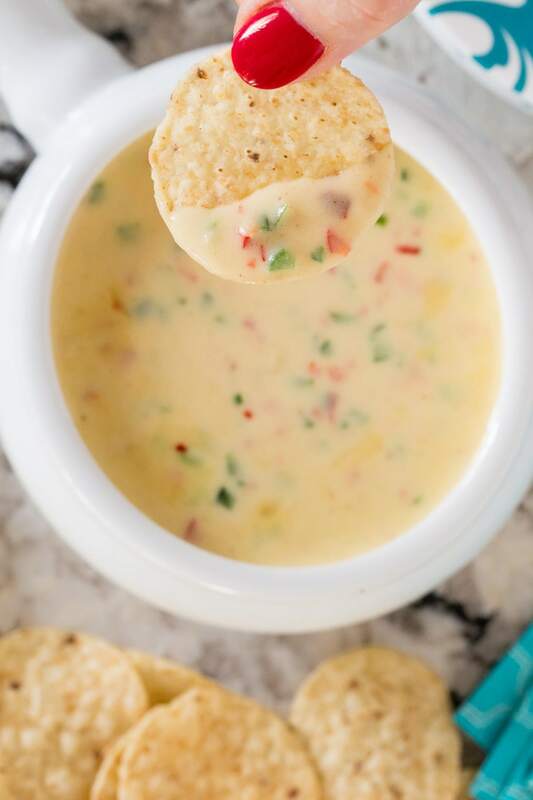 This Warm Jalapeño White Cheddar Dip is a delicious crowd-pleaser that you can put together in minutes. I also love that it can be made in advance and re-warmed quickly in the microwave just before serving! Although I love fresh salsas and guacamoles of all varieties, there’s also something wonderful about a warm appetizer/snack, especially at this time of year. And if it’s cheesy, loaded with fabulous flavor and served with tortilla chips, it will be my choice every time. 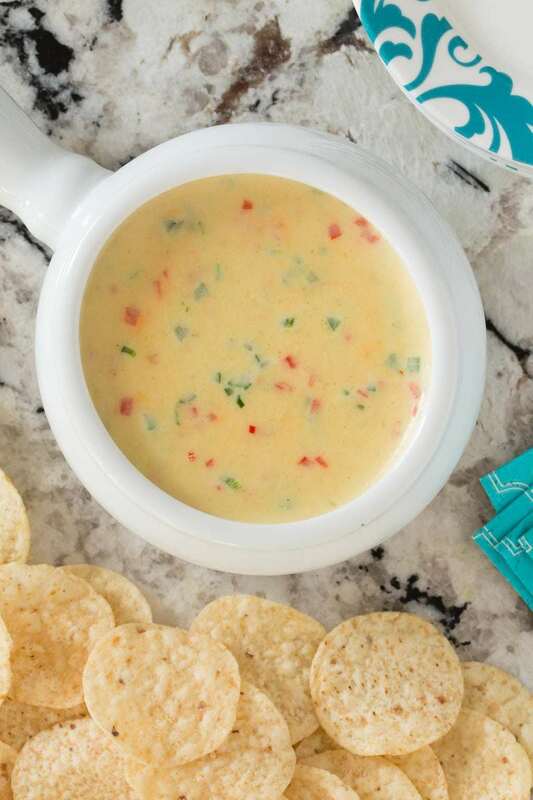 This Warm Jalapeño White Cheddar Dip ticks all those boxes! This dip is similar to the famous Queso dip that’s served at lots of Mexican restaurants. A few distinct differences are the type of cheese (white cheddar vs. Velveeta or American). I love that this dip calls for real cheese and not processed cheese, which so many Quesos include. 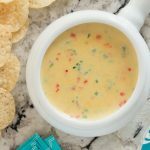 Another difference is that this Warm Jalapeño White Cheddar Dip gets its’ smoothness as well as a bit of tang from a small scoop of mayonnaise. And although some Quesos have chopped jalapeno as an ingredient, this one also contains finely chopped red bell pepper and a pinch of crushed red pepper, adding extra flavor, not to mention a beautiful presentation. 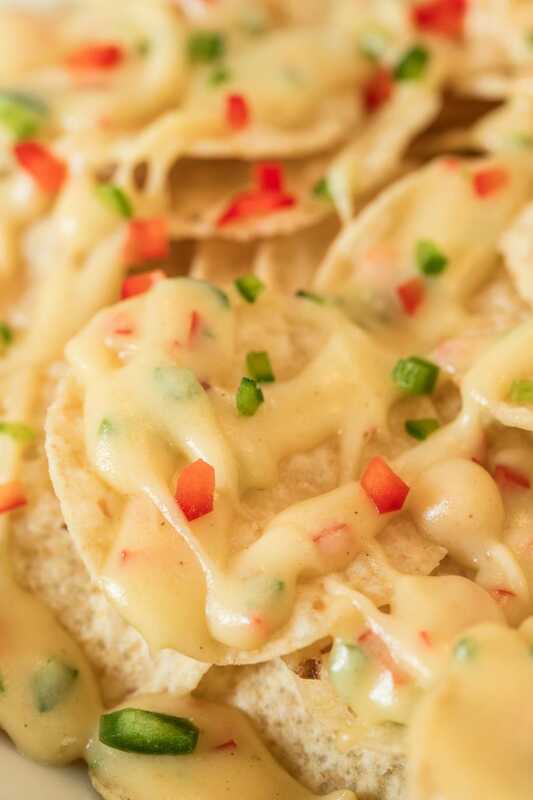 In addition to serving this Warm Jalapeño White Cheddar Dip in a bowl or ramekin with chips, it also makes a wonderful nachos topping. 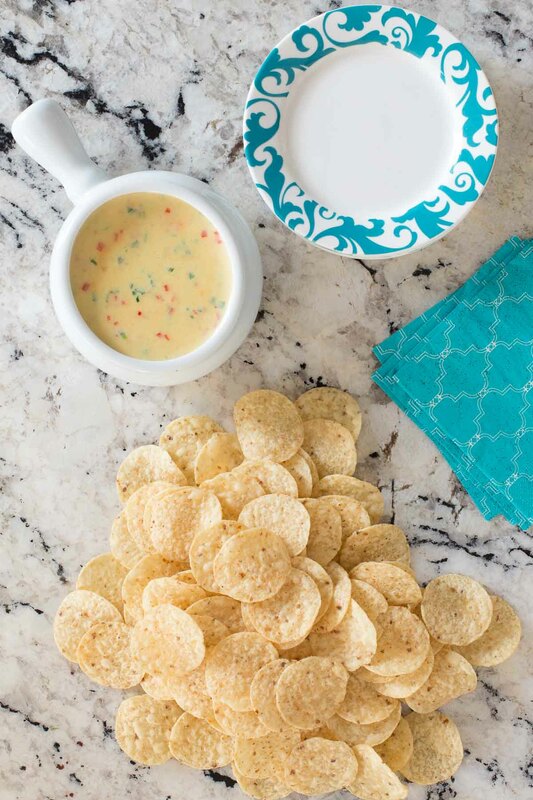 Just add a layer of chips to a pretty platter, drizzle with Warm Jalapeño White Cheddar Dip and repeat several times. Top with some extra chopped peppers for garnish and serve immediately. Or keep the nachos warm in the oven until ready to serve. Delicious! If you’ve got 15 minutes to spare, you can have a batch of this Warm Jalapeno Cheddar Dip made and ready to serve. You can also put it together, pop it in the fridge and re-warm it later. However you decide to do it, just do it! You’ll be super happy to have this delicious dip in your repertoire! Your family/friends will be even happier! Use a good quality white cheddar cheese. I like Cabot’s which is widely available at larger grocers. Use your favorite. Don’t use too much half and half to start. You can always thin out the dip, but you can’t make it thicker. Jalapeños can vary GREATLY in heat levels. You can always add more, so I recommend to start with 1-2 tablespoons and add more, to taste. If you want to cut back a bit on calories, this dip is also wonderful with a veggie platter. Serve the dip in a microwave-safe bowl or ramekin. That way you can easily warm it up a bit if it cools off too much. I love these white crocks which hold the temperature nicely. You can also divide the dip between two small bowls or ramekins. Place one on a platter with the chips. When it cools off, just replace it with a warm one. You can make this a day or two in advance. It will be thick, like a cheese spread when cold. Just heat it in the microwave until nice and warm. Add more half and half to thin to desired consistency. 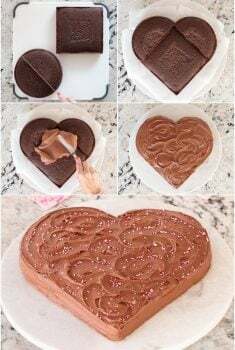 If you don’t have a microwave, this recipe can be made in a double boiler on the stovetop. You can also serve this Warm Jalapeño White Cheddar Dip cold or at room temperature as a cheese spread on crackers. The Café Sucre Farine is a participant in the Amazon Affiliate Program. Affiliate programs are designed to provide a means for sites to earn advertising fees by advertising and linking to products on Amazon. 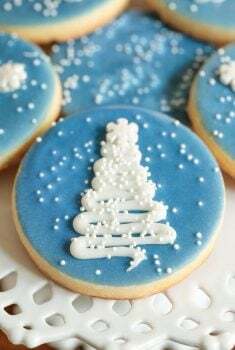 The price you pay as a consumer does not change, but if you make a purchase we will receive a small commission – and we continue delivering delicious recipes to you! Want to see more delicious recipes from The Café? Follow us on FACEBOOK where every day we share new dinner ideas, entertaining ideas and everything in-between! We’re also on Instagram and would love to meet with you there! This Warm Jalapeño White Cheddar Dip is addictingly delicious so be sure to make plenty! Guaranteed to disappear in the blink of an eye! Coarsely grate the white cheddar cheese. Combine the grated cheese and corn starch in a large microwave-safe bowl. Toss with a fork to combine. Add the half and half, mayonnaise, cumin and onion powder and stir to combine. Microwave on high power for about 1 minute, until cheese is mostly melted. Stir well and return to microwave for 1 more minute. Stir until all cheese is melted and the mixture is smooth. Add red peppers, 1-2 tablespoons of the jalapeños and crushed red pepper. Stir to combine. Add a little more half and half if the mixture is too thick. Taste and add more jalapeños and/or crushed red pepper if more heat is desired. Serve with tortilla chips. See Café Tips above for more detailed instruction, how to make ahead and extra tips. I would have never guessed mayonnaise as an ingredient and that last picture took me over the edge! Made this and it is yummy! I hate how some cheeses can break down and seem ‘greasy’ but the mayo is the trick here and it is brillant! Thank you, Chris, for another superb recipe! Yay! 🙂 Thanks for taking the time to share your results! My husband Tom and I would be fighting over this Chris! 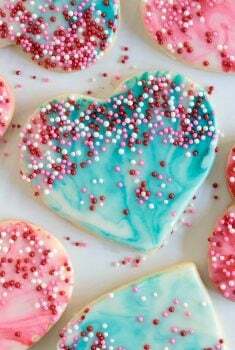 Looks creamy and delicious! Lovely dip Chris! 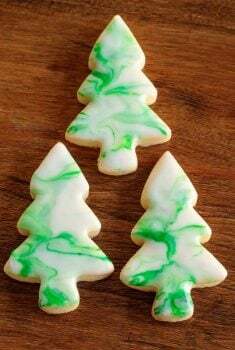 I could put it on everything 🙂 I tried something similar using cornstarch last year – love it! I, too, love that this dip is made with unprocessed cheese! I can almost taste the flavors…Delish! Wonderful. I too, never ever use any processed cheese product. So easy and mess free. Thanks! Thanks, Ann, so happy you enjoyed it! This is the perfect dip for game day! Ah ha! Mayonnaise, how brilliant Chris! Whoa, I’d try to behave and eat this with veggies, but I’d have to try it with tortilla chips, too. Hard to be virtuous ALL the time, right?? What a perfect Super Bowl munchie! Just hand me a big spoon, Chris, no chips required…I could eat this stuff all day ~ pinning!